City Attorney Dennis Herrera at a press conference announcing his lawsuit against President Trump for his unconstitutional executive order targeting sanctuary cities. 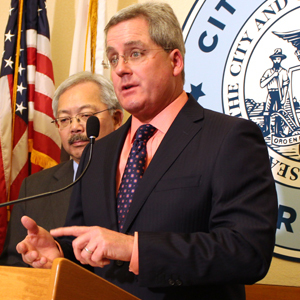 SAN FRANCISCO (Jan. 31, 2017)—City Attorney Dennis Herrera today filed a federal lawsuit against President Donald Trump and his administration for his executive order directing enforcement action against sanctuary cities and threatening to withhold federal funding from these cities. The suit claims that the order is unconstitutional and exceeds the president’s power. Herrera’s lawsuit comes after President Trump issued an executive order last Wednesday announcing that it would seek to deprive “sanctuary jurisdictions” of federal grants. San Francisco receives over $1.2 billion a year in federal funding, most of which goes to health care, nutrition and other safety net programs. The Tenth Amendment to the U.S. Constitution – part of the Bill of Rights – embodies the principle of federalism. The amendment states that the federal government possesses only those powers provided by the Constitution. All remaining powers reside with the states or the people. This lawsuit challenges the constitutionality of the executive order and a related federal statute. It requests a finding that San Francisco complies with applicable federal law and seeks to prevent the federal government from cutting funds to San Francisco. The Trump administration falsely believes that sanctuary cities harbor criminals and make communities unsafe. To the contrary, any persons who is booked in San Francisco has their fingerprints sent to the federal government. If the federal government has a criminal warrant for that person, San Francisco complies with that. Moreover, sanctuary cities have less crime, fewer people in poverty and lower unemployment than other counties, according to a recent study by Tom K. Wong, an associate professor of political science at the University of California, San Diego. There are, on average, 35.5 fewer crimes committed per 10,000 people in sanctuary jurisdictions compared to non-sanctuary counties, according to Wong’s findings in a report for the Center for American Progress. For these reasons, more than 400 cities and counties across this country – including nearly every major city from New York to Los Angeles – have sanctuary policies. They recognize what San Francisco first recognized 28 years ago when it learned that undocumented victims of domestic violence were too scared to report they were attacked because they feared being deported. Sanctuary policies encourage undocumented immigrants to report crimes so that the police can get violent criminals off the street. Sanctuary cities protect children by ensuring that their parents feel safe taking them to playgrounds, to schools, to the hospital. Sanctuary city policies protect families. Sanctuary city policies protect all of us. The suit was filed in the U.S. District Court for the Northern District of California this morning against President Trump, the United States, Department of Homeland Security Secretary John Kelly, and the acting Attorney General Dana Boente. The case is: City and County of San Francisco v. Donald J. Trump, et al., U.S. District Court for the Northern District of California Case No. 3:17-cv-00485, filed Jan. 31, 2017. Additional documentation from the case is available on the City Attorney’s website at: https://www.sfcityattorney.org.